TV mom Michelle Duggar is pregnant with No. 20. The fertile reality mom told the "Today" show she is three-and-a-half months in and feeling great at age 45. "We are so excited," Duggar said before the broadcast. "I was not thinking that God would give us another one, and we are just so grateful." The Arkansas mega-family stars in its own reality TV show, “19 Kids and Counting,” on TLC. The number in the show's title was last changed in 2009, and last summer, when the last appeared on "Today," it was the longest Michelle had gone without a pregnancy in more than 20 years. Dugar told "Today" she's over her first-trimester morning sickness, has been indulging her cravings for dill pickles, and is feeling great. She said her doctors have given her the green light for this pregnancy, and so far she hasn't had any health worries. For the past year, she said, she's been working out five or six days a week. "I'm really in better shape than I've been in 20 years." 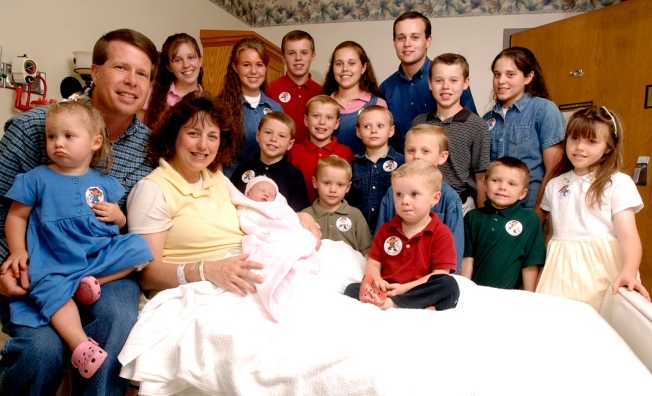 The Duggars' 19 children range in age from 23 years to 23 months. Proud patriarch Jim Bob Duggar said he's ecstatic. "Michelle and I both feel like some of the most blessed parents in the world," he said. "We didn't want to stop on an odd number."